'4 Shore' is a fabulous home in South Nags Head! Watch the sun rise over the Atlantic from the ship's watch, play on the beach all day, and regroup with a cocktail on one of several private decks. This home offers many amenities including a private pool, hot tub and a game room. This home is also very close to many activities in Nags Head. The Tanger Outlet Mall is just up the road, as are several popular restaurants including Pamlico Jack's, Sugar Creek, Owens, and Basnight's Lone Cedar. Parasailing, jet ski rentals, Bodie Island lighthouse and many more entertainment options are within a mile or two of 4 Shore. The top level of this well-appointed Outer Banks vacation home has an open floor plan and lots of windows to maximize the incredible views. Hardwood floors, built-in shelving, granite countertops in the kitchen and premium finishes add that extra bit of luxury to make your vacation extra special. The king master bedroom on the top level features a whirlpool tub and separate shower. 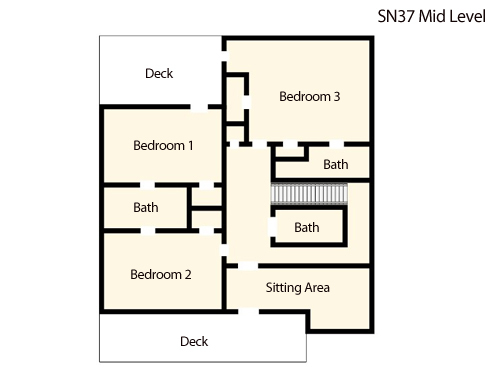 On the mid-level are two queen bedrooms and a third bedroom with a twin and pyramid bunk. There is also a den with a queen sleeper sofa, and three full baths. 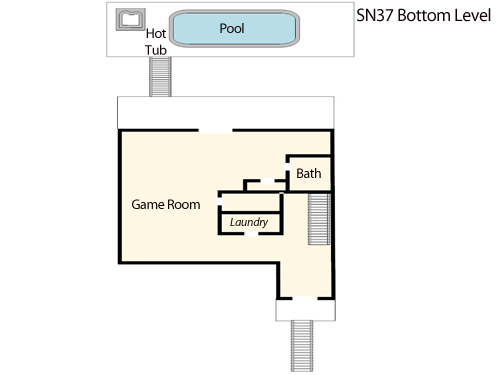 The lower level has the large game room, pool table, foosball table, and wet bar, plus a full bath and sleeper sofa. Guests cross the two-lane Old Oregon Inlet Road to get to the beach access, which is only 100 yards away! The home also backs up to the Cape Hatteras National Park, which provides lots of privacy and beautiful sunsets. No Smoking. Pet Friendly. Fireplace not available for guest use. We loved the home and its location! The only things I would say need replaced are the mattresses. The air wasnt working that well in the master suite on the 3rd floor, but still comfortable. There seems to be a little water damage on the ceiling in the bunk room on the 2nd floor. We really enjoyed the pool area when we couldnt make it to the beach because of weather. Thank you Christine for your review. We are so pleased to hear you loved your home and the location. I am happy to report that all of the King and Queen mattresses have been replaced. We look forward to seeing you and your family again next year. My family loved the house! Convenient to the beach and restaurants! One slight complaint would be that the beds are extremely hard so I would suggest to invest in better mattresses or pillow toppers! I would definitely recommend this house! Thank you for sharing your lovely home! Thank you Diane for your review. I am happy to announce this owner recently replaced all of the King and Queen mattresses in their home. We appreciate your helpful feedback, and look forward to welcoming you back to the Outer Banks in the near future. We had an amazing time at this beach house! It wasn't too far from the beach and the pictures don't do it justice. We had no issues with the house and loved every minute of it. The kitchen is well equipped with anything you need! Loved that it was pet friendly and we will definitely stay here again. The only thing we didn't like was the grill. Wish there was on that wasn't attached to the ground and it was gas instead of charcoal. Not sure why anyone would not recommend this place. We had no trouble getting across the street and barely had any television on. You're at the BEACH! Enjoy it! We can't wait to come back! Thank Adrian for sharing your recent experience. Your kind words are much appreciated, and I am happy to report this owner has recently added a new gas grill for his guest to enjoy. 4 Shore really is an amazing home in a fantastic location on the Outer Banks. We look forward to welcoming you back to the beach in the near future. We had a great time with our 3 families (grandparents, 4 parents, 3 children) at 4 Shore. The upper level kitchen/living/dining is gorgeous. Very open and spacious w/ views of ocean. The lower level is fantastic with TV, pool table, foosball, fridge, wetbar, and bathroom. Location to the beach is wonderful. Just cross the street and head a few houses south to the public access. The beach was not crowded at all. The 3 bedrooms on the 2nd level and office were adequate. The rooms are on the smaller side. All 3 bathrooms are very small, but didnt bother us. 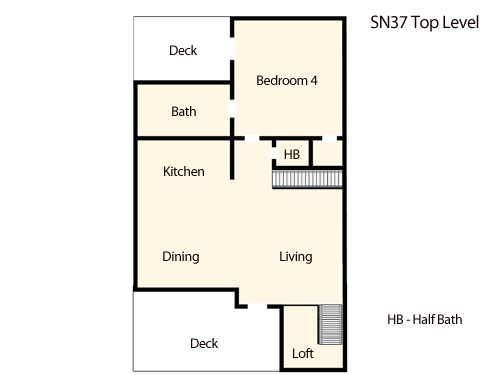 Every bedroom has access to a shared deck. The pool is approximately 10x20, which I would say is on the smaller side but adequate. The pool deck surface is paver stones, which need some work. There has been settling/heaving and the pavers are not level in many areas. The grill is a charcoal grill cemented to a post outside. We would have much more preferred a gas grill under the protection of one of the decks or carport. Thank you so much for your survey! We are so happy that you and your family had such a great time at "4 Shore" this past summer! I did want to update you that the owners noticed the pool area as well and are actually upgrading the pool area this winter, so it should be all even for next season! We should have new pictures of the pool this spring once the project is complete. We hope to see you the next time you visit The Outer Banks. House was just OK. It is obvious the owners don't use it much if at all. Major fails - no foot wash station, outdoor shower all the way in back, too small dishwasher, grill situation is abhorrent-unable to use unless perfect weather- they need a gas grill on upper deck, dish TV didn't work when it was raining. Kitchen was nice enough, master bedroom is big and so is bath - though shower is small. Pool works but outdoor furniture is Spartan. House is close to the beach but crossing the street can be challenging with traffic. Backing up to national seashore is nice. Overall would not recommend. Thank you for your feedback. We actually spoke directly with this owner about your concerns as they are highly involved in the management of their home and wanted to share a response. The outdoor shower was placed by the pool area, in the back of house, as that was considered the most convenient location. We have not had any complaints about this in the past as most people prefer the close proximity. The dishwasher is actually a normal sized dishwasher. Dish TV; I also have one and yes, when it rains, the reception goes. That is a part of island life and while we are used to it, I realize it is frustrating. For safety reasons and fire risk, the grill is not on the deck. While one must cross the two lane Beach Road, the beach access is very close to the house and traffic is actually lighter here, in South Nags Head, than in many areas of Nags Head or Kill Devil Hills. We appreciate your thoughts and allowing us the opportunity to address them. This is our second year staying in 4shore, great house and the location to the beach is great! Village realty is always easy to work with. The house needs a little maintenance (pool pump/deck) but otherwise we really enjoyed our stay. We really enjoyed our stay making memories with our families while staying at 4 Shore. We have been to the Outer Bamks many times over the years and have enjoyed the friendliness and convenience of Village Realty. The convenience of check-in and the mobile checkout was great! Your app was easy to use and very helpful. Thank you for making our vacation hassle-free! The Feldhaus, Meuleman, and Alesi families from Ohio.